When it comes to purchasing an efficient concrete mixer, there is no better man to ask than Todd Struckell of Bull Mixa who began building self loading concrete mixers in 1999 out of an inspiration to get a multitude of jobs done and a need for a handy and time saving concrete mixing tool to do it. Bull Mixa self loading concrete mixers are available in a range of sizes, from a bobcat sized 0.2m bowl to a massive 2m bowl. 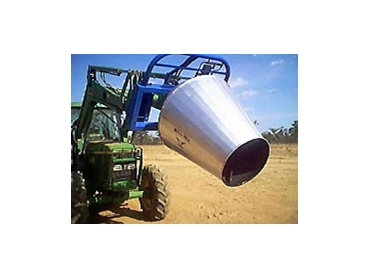 Custom self loading concrete mixers are also able to be made to required specifications. Bull Mixa self loading concrete mixers can be quickly and easily attached to all front end loaders, tractors, excavators, backhoes, bobcats or any 3-point linkage with hydraulic remotes, and takes over where the old hand concrete mixer can no longer cope. The average Bull Mixa self loading concrete mixer, the 0.4m bowl size, requires only 6-8 gallons of oil to drive the bowl, meaning a moderately sized loader will have ample capacity to operate the mixer. These self loading concrete mixers are equipped with variable speeds for forward and reverse and are fitted with a safety stop function. There are also inner spirals for greater mixing and reversing control. Bull Mixa use only quality materials in the construction of their self loading concrete mixers, with replacement mechanical parts readily available from leading spare parts stores.